Swrve now provides SDK integrations with several set top box and TV operating systems (OTT). For Apple, Android and Amazon platforms, the native SDKs include OTT support as of SDK version 5.2. Other OTT platforms are available as a separate SDK. For more information on specific platforms and features available, see the sections below. The following table details the Swrve features and campaign types currently available for OTT platforms. 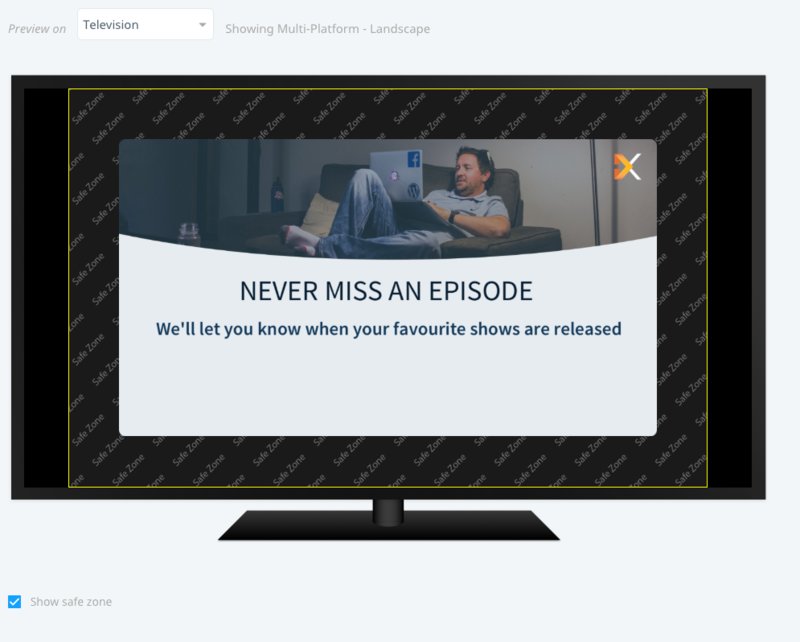 The available features work the same as you would expect on other platforms and the in-app message campaign flow now includes TV as an option in the device previews. Swrve iOS SDK 5.2 includes support for tvOS, with some slight modifications in the installation steps for Carthage or manual installation. For more information, see the iOS SDK upgrade guide or iOS integration guide. Swrve Android SDK 5.2 includes support for Android TV. There are no additional installation steps, however you must set the Android SDK version to a minimum of 21 to run Android TV. For more information, see the Android SDK upgrade guide or Android integration guide. Swrve Android SDK 5.2 also includes support for Amazon Fire TV. Follow the integration steps outlined for Amazon and ensure you set the Android SDK version to a minimum of 21. For more information, see the Android SDK upgrade guide or Android integration guide. The Swrve Roku SDK is now available on Github, for more information see the Roku integration guide. To have your app enabled to use Roku features, contact your CSM at support@swrve.com. The Swrve Smart TV SDK supports devices using Tizen (Samsung) or webOS (LG) OTT platforms and is now available on Github. For more information see the Smart TV integration guide. To have your app enabled to use Smart TV features, contact your CSM at support@swrve.com.